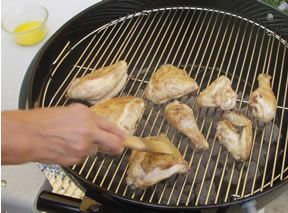 Grilling and broiling are very similar methods of cooking chicken. They both use a dry heat that quickly cooks the surface and then slowly moves to the middle of the meat. Also, grilling infuses the chicken with a smoky flavor from the meat juices that drip during the grilling process. When broiling, this infusion of flavor does not occur. The main difference between the two methods is that grilling applies the heat to the bottom surface of the chicken, and broiling applies the heat to the top surface. Before cooking, check the size of the chicken pieces. 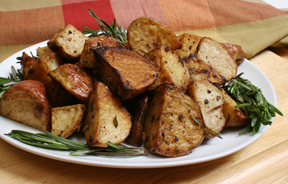 Cut the larger pieces to smaller sizes so all pieces will cook more evenly. 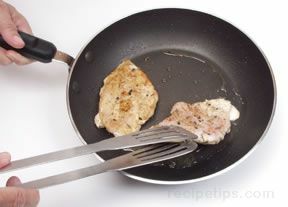 Flatten chicken breasts so that they are more uniform in thickness. If cooking a whole chicken, it should be butterflied for more even cooking. 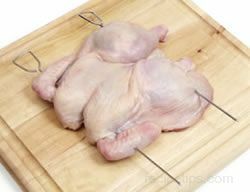 To butterfly, the backbone is removed, the breast bone is pressed down to flatten the chicken and skewers are used to help the bird lay flat by threading them through the breast and thigh area (see Chicken Preparation - Butterflying Chicken). When grilling or broiling, the chicken will have a tendency to dry out so it must be watched carefully during the cooking process. Coating the chicken with a little oil or marinating it will aid in preventing it from drying out while cooking. Also, the temperature at which the chicken is cooked and the distance the chicken is from the heat source are both important to tender, juicy, properly cooked chicken. The grilling process cooks foods over a heat source, either directly, indirectly, or a combination of both. Grilling temperatures typically reach as high as 650ºF, but any temperature above 300°F is suitable as a grilling temperature. 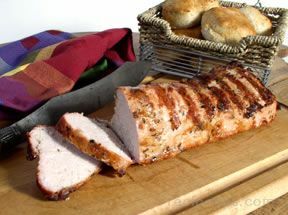 The high heat of grilling sears the surface of chicken, creating meat with a flavorful crust. 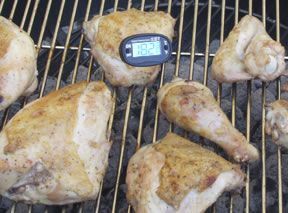 The required cooking temperature and the method of grilling (direct, indirect, or a combination) depends on the size of the chicken or the pieces. It is important to cook the chicken to its proper doneness but not to overcooked. 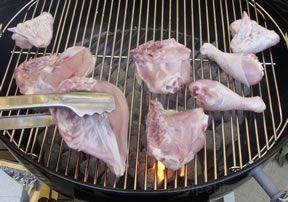 There are many different types of grills available today that can be used when grilling chicken. 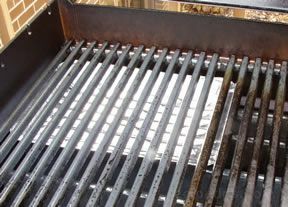 For information on the different types of grills, see Types of Grills. It is important that the grill is set up properly and reaches the appropriate temperature for the type of chicken that is being grilled to ensure that it produces in a juicy, tender finished product that is cooked to the proper doneness. For information on setting up a charcoal or gas grill, see Outdoor Grilling Safety and Preparation. A medium heat should be used when grilling chicken. 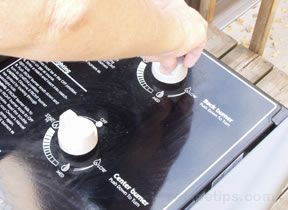 Using too high of a heat will cause some parts to cook too quickly and dry out while other parts will not be done all the way through. 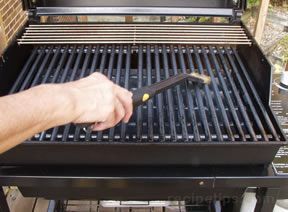 To check the temperature of the grill, see Estimating Heat Level to see how to use the palm of your hand for testing. The thicker the cut the farther away from the heat source it should be or the heat source should be at a lower temperature to prevent the outside of the cut from burning before the inside is properly cooked. You will also have to decide whether you will use direct or indirect heat during the grilling time. Depending on the type of chicken, you may use both. A whole chicken or a thick piece, such as a full breast, may require direct heat to seal the outside and indirect to allow the cut to cook thoroughly to the center. Cooking with indirect heat occurs when you use an area of the grill that is not directly over the heat source. Using indirect heat slows the cooking process down, which allows the center of the cut to cook thoroughly without burning the outside. 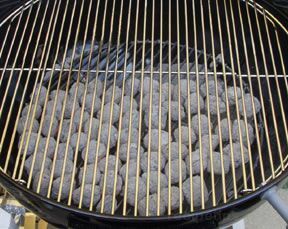 On charcoal grills, coals are pushed to one side of the grill or banked into a ring around the outer edges. 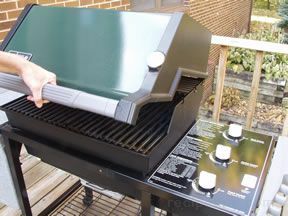 On gas grills, the side of the burner, which is below the area where the food will be placed, is turned off after the grill is preheated. 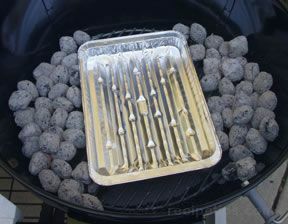 Using one of the indirect setups will provide an area on the grill that is a low heat source. 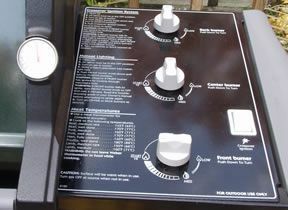 The meat is placed over the area in which there are no coals or over the burner that is turned off on a gas grill. Indirect heat is good for cooking whole chickens or larger pieces, such as a full chicken breast. 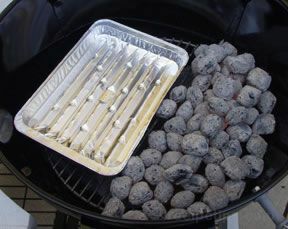 Once the chicken is prepared and the charcoals have been heated properly (see Charcoal Grill Setup), there are several easy steps to follow in order to cook chicken with indirect heat on a charcoal grill. When using any of the indirect methods, the chicken is generally cooked with the cover on the grill. 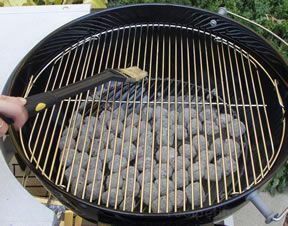 Any of the indirect charcoal grill setups provide an area on the grill, directly above the drip pan and away from the coals, that creates the indirect heat area. The chicken is generally seared directly over the coals first and then moved to the indirect heat area to finish cooking. 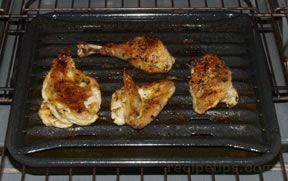 Once the chicken is prepared and the gas grill have been heated properly (see Gas Grill Setup), there are several easy steps to follow in order to cook chicken using indirect heat on a gas grill. A drip pan is placed on the opposite side away from the direct heat of the front gas burner. The chicken is seared over the direct heat of the front burner and then move to this location where it will finish cooking. 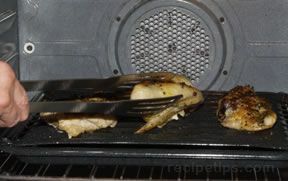 The hood of the grill should be closed while allowing the chicken to finish cooking using the indirect heat of the grill. Cook until internal temperature reaches the proper temperature. The proper doneness for white meat is 170° to 175°F and for dark meat it is 175° to 180°F. Remove the chicken when the internal temperature is 5° below the desired temperature. Then allow it to stand for 15 minutes before carving or serving. During this time the temperature should rise another 5° to 10°F, which will bring the chicken to its proper doneness. Cooking with direct heat occurs when you cook the meat directly over the heat source. 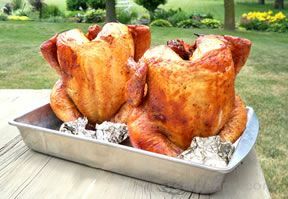 The chicken is cooked quickly over medium or high heat coals or over burners set to medium or high heat on a gas grill. 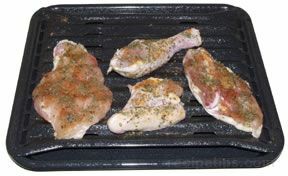 Direct heat is used when grilling food that cooks in 30 or less minutes, such as boneless chicken breasts and chicken pieces. 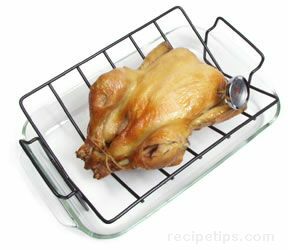 To help prevent the chicken from sticking to the grate on which it will be placed, brush the grate with oil and preheat the grill before placing the meat on the grate. The grill should be heated to a medium heat (see Grill Temperatures). Also brush oil on the surface of the chicken to help prevent sticking. Place the dark meat pieces of chicken on the grill first because they require more cooking time than the white meat. Place the pieces skin side down. 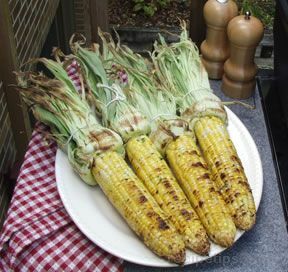 Place cover on the grill and let pieces cook for 4 or 5 minutes. After the dark meat has cooked for 4 or 5 minutes, add the white pieces to the grate, skin side down. The wing pieces should be kept to the outer edges of the grill where there will be less heat. Do not overcrowd the pieces. Be sure to allow an area that the chicken can be move to if a flare up occurs. Place cover on the grill and continue to cook. Cook for 5 or 6 more minutes, remove cover, and turn all the pieces. 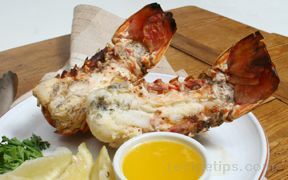 Baste with melted butter to prevent chicken from drying out. Cover and cook for 6 to 8 minutes longer or until done. Chicken is done when the white meat reaches 170° to 175°F and the dark meat reaches 180°F. The cooking temperature typically reaches 450ºF to 650ºF when grilling over direct heat. Thin pieces of chicken are quickly grilled over these temperatures, so check often and watch carefully for visual signs of doneness. 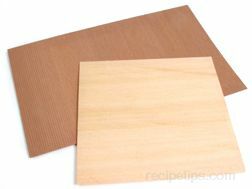 It is generally suggested to turn the pieces only once. 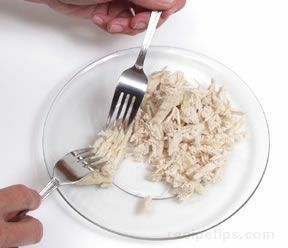 Use tongs or a spatula to turn the chicken. 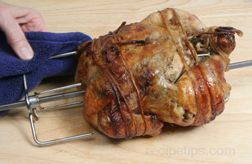 A fork should not be used because it will pierce the meat, allowing juices to escape. 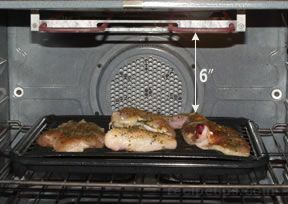 When grilling chicken with direct heat on a gas grill, all of the burners are turned on to provide a uniform temperature under the entire cooking surface (grate). Chicken is cooked over burners set on medium heat. 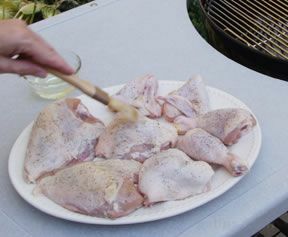 While the grill is preheating, brush the surface of the chicken with oil to help prevent them from sticking to the grate. Place the chicken pieces on the oiled grate once the grill has preheated to the proper temperature (see Grill Temperatures). 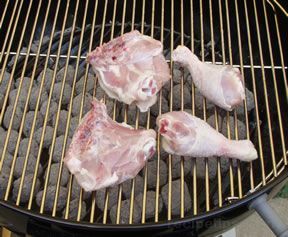 Cook the chicken in the same manner as shown above on the charcoal grill, using direct heat. The chicken is generally cooked with the hood down and is turned once during the cooking process. 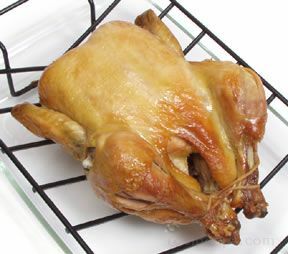 When broiling chicken, there is no benefit from the infusion of smoked flavoring that occurs when grilling, causing the chicken to be fairly bland in taste. This can be remedied by the use of seasoning, such as a mixture of herbs, marinades or basting sauces. Use seasoning to add flavor to the meat. Chicken pieces should be placed on the broiler rack skin side down. 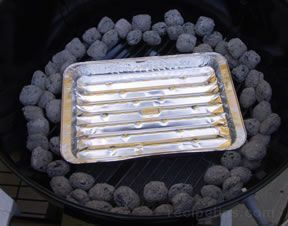 Do not line the broiler rack with aluminum foil because it will prevent the drippings from falling into the pan below and the drippings that remain on the foil may cause flare-ups to occur. As with grilling, the distance from the heat source is important for proper cooking and producing chicken that is golden brown, juicy, tender, and thoroughly cooked but not overcooked. To check for proper cooking distance for broiling, place pieces on the broiler rack and place the rack on the broiler pan. Set the broiler pan in the oven and measure the distance from the heat source in the oven to the top of the chicken. It should be 5 to 6 inches away, adjust oven racks accordingly. Remove broiler pan from the oven and preheat the broiler for 9 or 10 minutes. With chicken pieces skin side down on the broiler rack, place them in the oven to cook. As with grilling, it is necessary to watch the chicken carefully as it cooks, making sure the edges are not cooking too fast and if they are, rearrange the pieces or adjust the heat accordingly. When one side is nicely browned, turn the chicken pieces to finish cooking. 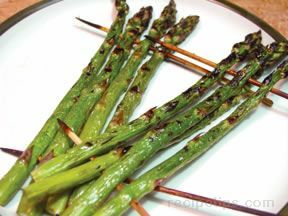 When grilling or broiling, all the pieces will not cook at the same rate so it is necessary to remove them as they finish cooking to avoid overcooking. Whenever possible, it is best to leave the skin on the chicken during grilling and broiling, If you prefer skinless chicken, remove the skin before serving. Leaving the skin on will provide a juicier, more tender piece of chicken and will not increase the fat content as long as it is removed before eating. 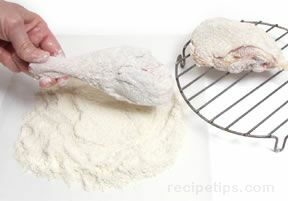 If the chicken has already had the skin removed, coat it before cooking to prevent it from drying out. The chicken can be coated with cooking oil, a liquid marinade or any type of moist marinade. The chicken must be checked for proper doneness when using either cooking method. The best way to check doneness is to use a meat thermometer. 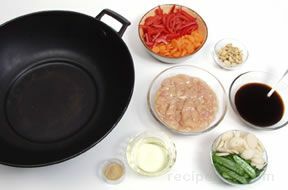 Ground chicken and chicken breast must reach 170°F. Whole chickens and other pieces should be 180°F. 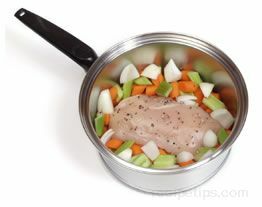 If a meat thermometer is not available, a visual test can be performed by piercing the pieces with a fork. If thoroughly cooked, the juices should run clear. Doneness can also be checked by cutting into the thickest part of the chicken and making sure the meat is opaque all the way through. 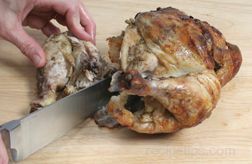 To prevent dryness, leave the skin on the chicken during cooking, which helps preserves the chicken's natural moisture. Be sure racks are clean and coat them with vegetable oil or a nonstick vegetable oil spray to help prevent sticking. When grilling, aromatic woods, such as hickory, mesquite or cherry, can be added to the preheated coals to give the chicken a distinctive flavor. 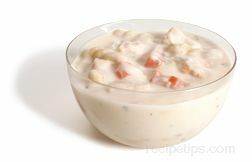 Place smaller pieces of chicken around the outer edges, further away from the main heat source, to allow them to cook slower. Do not use a fork to turn the chicken as it cooks. The piercing causes the juices to escape. To speed grilling or broiling time, partially cook the chicken in the microwave first. 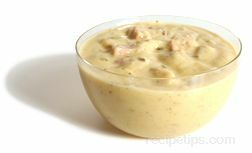 Microwave on high approximately 4 to 5 minutes per pound, or 3 to 4 minutes if using cut up parts. Grill or broil the microwaved pieces of chicken immediately to finish cooking.